Spiders Market - Functional to Fabulous! 10120 Lomas Blvd. N. E. in Albuquerque. 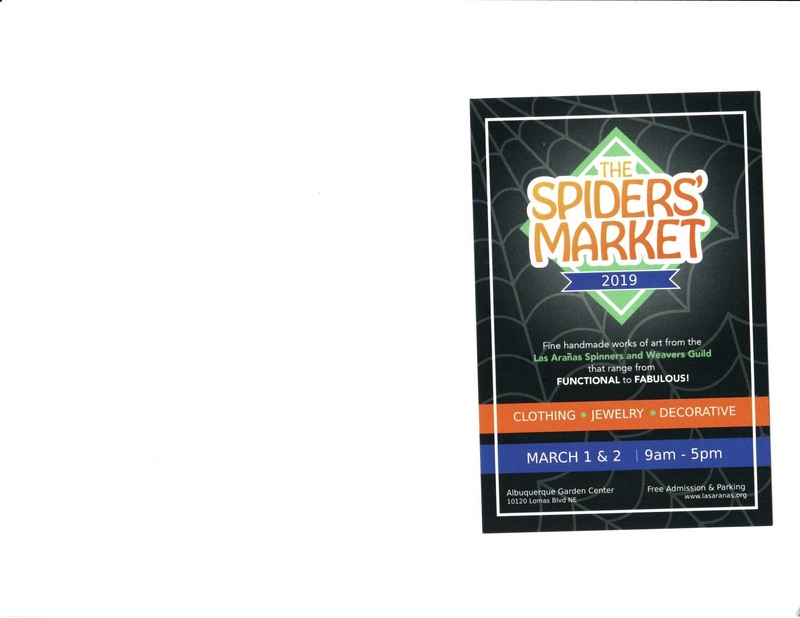 Spiders’ Market is our annual Spring Sale. It includes everything from pot holders to Tapestry, It will be held March 1 and 2. This year the silent auction will be held during the Thursday evening reception from 5-7. (Open to members of Las Aranas and their guests) There will be sales of goods then as well. In 2018 the auction was fantastic and had incredible bargains. It will be just as terrific in 2019. Come snag a great deal! It is the premier destination for handmade textiles. Member artists of the Guild are creating unique hand woven, hand knit, hand spun, handmade works of art that range from functional to fabulous. 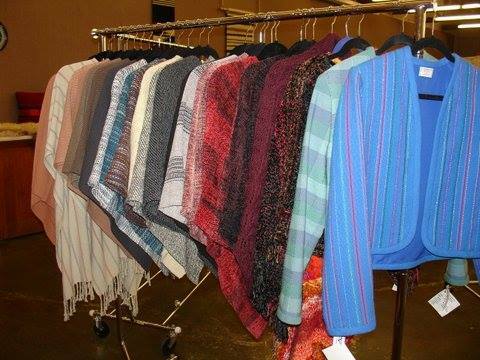 The Guild Sale is held only once a year and is a MUST for anyone looking for elegant hand-woven clothing and accessories, hand-dyed silk scarves, unique handmade jewelry as well as distinctive interior furnishings like woven rugs, placemats, baskets and tapestries for the home. There will also be a section with used books and equipment, and an assortment of fiber available! 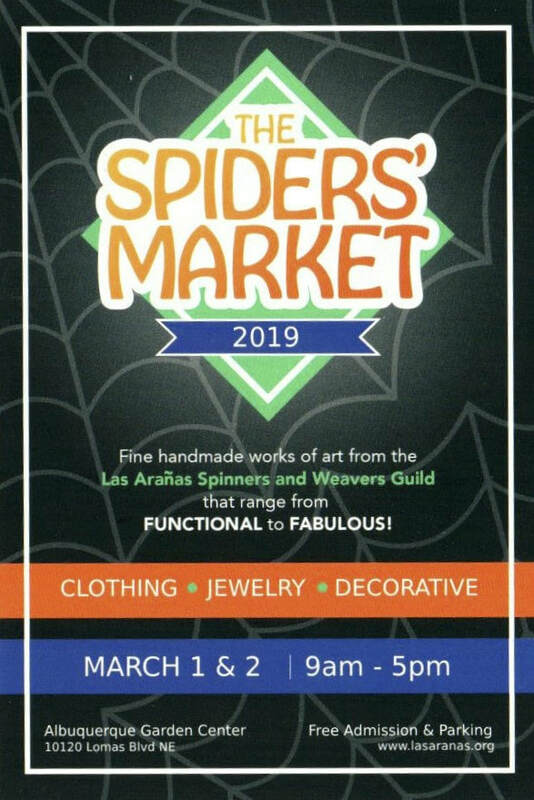 Las Arañas Spiders' market is an incredible treat for your senses ... full of rich fiber textures and a rainbow of colorful art pieces to wear, give as memorable gifts or display in your home! Join us! 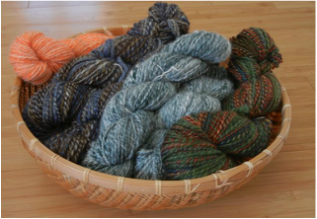 If you are participating as a vendor in Spider's Market, PLEASE be sure to review the rules of the sale, listed in the Las Arañas Spinners and Weavers Guild Membership Book. Many patrons are seeking high quality, unique hand made items. Our biggest selling category is hand weaving. Although inexpensive items sell well, take the time to submit one "extra special" item that reflects your talent and skill in your choice of media. This year the silent auction will be held during the Thursday evening reception. (Open to members of Las Aranas and their guests only.) There will be sales of goods then as well. In 2018 the auction was fantastic and had incredible bargains. It will be just as terrific in 2019. Come snag a great deal!